With the win on Friday, the Crimson brings the season series against Dartmouth to a 1-1 tie. 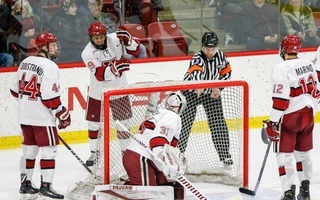 Unless the teams meet again in the ECAC playoffs, that result will stand for this year. Before taking the ice for its first Beanpot matchup on Monday, the Harvard men’s hockey team had to contend with Ivy foe Dartmouth. 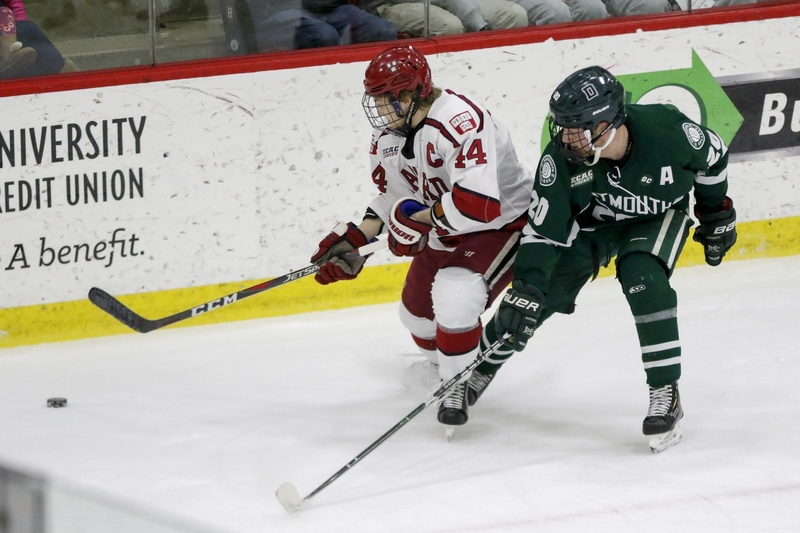 The Big Green visited the Bright-Landry Hockey Center in the hopes of derailing the Crimson’s first hot streak of the season — perhaps the hosts would make the mistake of overlooking Dartmouth in light of the upcoming big game. That seemed like it would be be the story on Friday night, until No. 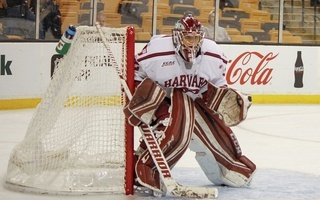 19 Harvard (11-6-3, 8-5-2 ECAC) fought its way back to overcome the Big Green (8-11-2, 7-6-1) by a score of 4-1. Dartmouth’s strong first period showing could not make up for the Crimson’s late goals, and the visitors left the ice disappointed despite outshooting Harvard, 35-23, in the game. Shots on goal were even more lopsided in the first period, when the Big Green put 14 pucks on net to the Crimson’s three. Dartmouth was faster out the gate than the hosts and nearly broke the ice around the five-minute mark, though that attempt was waved off and reviewed to confirm no goal. The Big Green’s swarming offense forced Lackey to scramble in the paint on several occasions. In the end, it was an unlikely shot that beat him: a floater from senior defenseman Connor Yau that snuck between his pads. The turning point for the Crimson came early on in the middle frame. After outlasting a penalty that carried over from the first period, Harvard mounted the pressure on the Big Green. Rookie forward Baker Shore tossed the puck on net from the left circle; though Dartmouth junior net-minder Adrian Clark stopped his attempt, co-captain Lewis Zerter-Gossage was in the perfect position to bat the biscuit into the back of the net. Just four minutes into the second period, the Crimson had evened up the score. 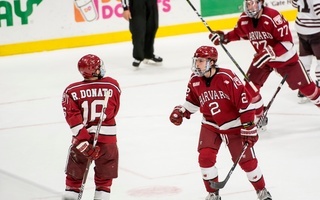 Harvard continued to push, but could not capitalize again that period. When the teams left the ice after 40 minutes, the score was still knotted at one. The Crimson had suffered a different kind of blow, though; sophomore forward Henry Bowlby, who returned after missing last Saturday’s game against SLU, was issued a game misconduct for hitting from behind. The team killed off the ensuing five-minute penalty, but was short a man for the rest of the matchup. Co-captains Floodstrand and Zerter-Gossage provided the Crimson's crucial goals on Friday. The pair have scored in the same game three times so far this season. Still, it was with renewed energy that Harvard returned to the ice. Only 2:34 into the final frame, the team found its reward. Senior forward Frédéric Grégoire fired a shot into Clark’s glove, which the net-minder struggled to collect. In a scramble around the blue paint, co-captain Michael Floodstrand was able to push the puck past him, earning the Crimson its first lead of the night. From there, sophomore linemate Jack Donato joined in on the scoring, corralling a loose puck near the slot to shoot it home. An empty-net tally from Zerter-Gossage sealed the deal for the home team. The forward’s clutch two-goal performance adds to his team-best 12 goals. 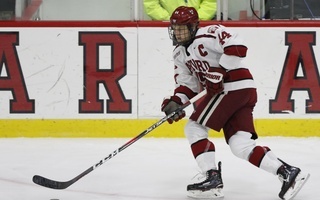 Harvard’s other two notches both came from the fourth line of Floodstrand (1 G, 1 A), Donato (1 G), and Grégoire (2 A). The co-captains made the difference on Friday, scoring the tying and game-winning goals. Lackey turned away 34 of 35 shots on the night, good for a .971 save percentage, despite giving up a soft goal early on. After his shaky start, Lackey’s recovery and the Big Green’s high shot volume resulted in a stellar .971 save percentage. The net-minder was especially solid in helping shut down Dartmouth’s power play, which could not convert on its five-minute opportunity. In fact, special teams played out tonight contrary to the Crimson’s usual style. The nation’s best power play (34.3%) was unable to find twine, despite a 5-on-3 chance, and instead Harvard’s lackluster penalty kill (75%) held sway. 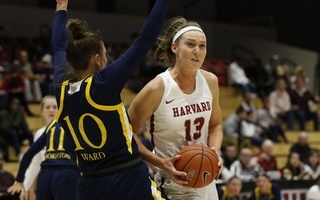 Harvard’s two points boost the team to second place in the ECAC, though it has played two more games than most other squads. 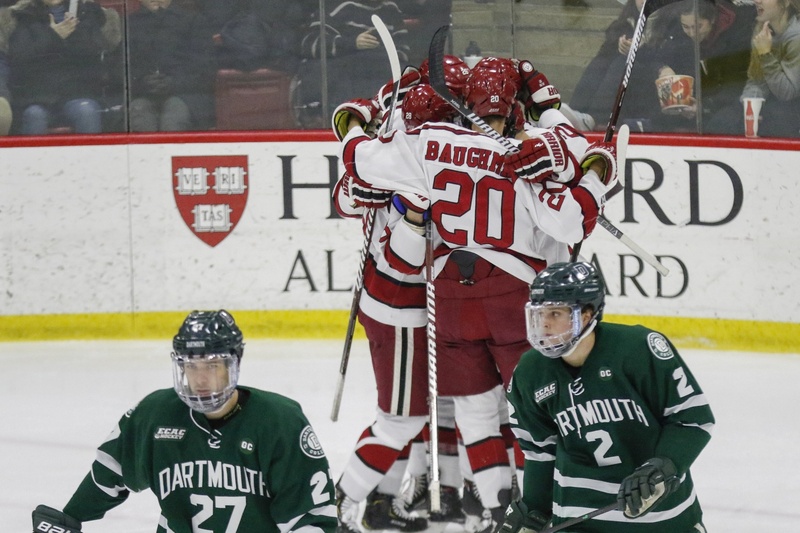 Perhaps most important, though, is that the newly-ranked Crimson extended its winning streak to four straight and will carry that momentum with it into the Beanpot. As the ECAC race gets ever closer, Harvard will need confidence and drive on its side.